worst shopping day of my life spoiled my mood, before enter to the shop i was very enjoying my day off but while coming out of your store I was completely upset the reason are: 1) first he shouted on my wife because my baby drop one crisp 2) when i asked for my size first he didnt took me later after long time he brought 3) I didnt finished yet I just kept one shoe on the shoe rack to compare with another one he asked me very rudely keep the shoe where you took from, i said let me check with another one 4)cashier niether welcome nor given me the name when i asked whats that guy name to make a complainted. i felt very disgusting. 5) when coming out of the shop the guy ran back to me by using bad words i ignored and came out of the shop please check ur cctv of his and her behavior so sad. tooooo bad custromer service. I never gonna recomend any one for this store to visit if possible i wil tell this to my friends aswell. I visited this store around lunch time and I was the only customer there. I asked one of the staff who was a short Somalian guy "where are your wide feet shoe section" and he just appeared very confused and told me "huh, what's that" and walked out. There was 3 staffs; 1 guy and 2 ladies on the till I was there with my Christmas shopping bags, struggling to find a pair of size 7 pumps, instead of asking me if I needed some help they were just standing there chatting about their lunch and private life. When I arrived at the till I asked the girl "how do I make a complaint about your customer service" she was very unfriendly and just ignored what I said. 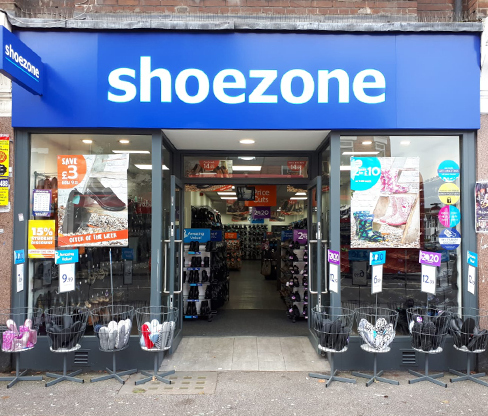 Am not really a fan of shoe zone shoes, the only reason I brought something was my mum was wearing a pair of high heels and I wanted to get her a pair of flat shoes as we were planning to do a lot of walking but after this experience I will never shop with shoe zone again. Staffs need basic training e.g how to welcome and serve staff correctly and not talk about their private lives during working hours and definitely not in front of the customer. The mature white lady was helpful and efficient.